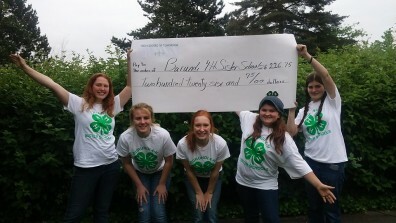 4-H Teen Leadership programs give adolescents the opportunity to develop advanced leadership abilities through a variety of real-life leadership roles. Teen Leaders of Tomorrow is program open for all members across the county (7th grade and above) to provide opportunities for teens to learn leadership skills by planning and implementing community service, 4-H promotions, fundraising and fun activities. The group meets once a month. Contact Nancy Baskett at nbaskett@wsu.edu or 253 224-2884 for more information . Teens as Teacher*: Health Rocks!® is a prevention and decision-making program, which also provides key health messages. Classes are taught by teen/adult leadership teams that help youth learn key health messages and skills such as critical thinking, how to manage stress, how to handle peer pressure, and how to communicate effectively. Teens as Teacher*: Food Smart Families is a program where are teens are trained to teach classes to younger youth healthy eating and exercise activities using Food Fun and Fitness curriculum. NW District Teen Rally is usually held one weekend in October hosted by one of the northwest counties in Washington for grades 7-12. Teens from multiple counties get together for educational workshops, special speakers and fun! Summer Inbound Exchange Student Programs – Our Summer Inbound programs bring youth to the US each summer to stay with a host family for 4 weeks. Based on a complete cultural immersion model, youth are matched with a volunteer American family who wants to share their life with an international visitor. To learn more or apply to be a host family, please visit this link: Become a Host Family. Summer Outbound Exchange Student Programs – Our Summer Outbound programs send American 4-H youth to foreign countries for a cultural immersion experience. Outbound delegates live with volunteer host families, learning first-hand about a new way of life in the host country. Our international partners recruit host families and plan enrichment activities for the delegation. All S4-H Outbound programs include pre-departure orientations in the US, adult chaperones who accompany the group on international travel and remain in-country to provide support during the exchange, in-country orientation, a homestay experience, and some limited sightseeing opportunities in the capital city or other major attraction. Some programs offer a summer camp experience as well. Academic Year Exchange Student Programs (AYP) – American families have the opportunity to host a high school student for one academic year (August-June). Students are enrolled in public high school and participate in school activities as members of their host families. S4-H places students from Japan, Korea, and Eurasia through AYP. Our Eurasian students are scholarship recipients participating in the Future Leaders Exchange Program (FLEX), which is sponsored by the US Department of State, Bureau of Educational & Cultural Affairs. State coordinators and local representatives in the host community provide support services for host families and exchange students throughout the school year.